You can provide your own foot pain relief, in most cases. I will show you simple and effective techniques to free the inappropriately tight tissue that is most likely causing your symptoms. are below on this page. This short introductory video is a great place to start. It will help you get the best possible results from the videos below. Siting on a bench or in a chair, or lying on the floot. Take the foot experiencing foot pain and rest it on your opposite thigh or knee just like your were crossing your leg in normal life. Now, position the ankle so it hangs out past the leg it is resting on……again just like one would often do in regular life. Reach over the top of your foot with the hand from the same side as your foot pain and press your fingertips into the top upper half of your foot. Flex your toes up and down and let your fingers feel the muscles that perform that function moving under them. These are the muscles you want to make sure are free. Now perform the press-hold-move technique. It's easiest if you try and flex all your toes at once, up and down, up and down, etc. Notice how much foot pain relief this one technique provides. As you just did for technique A, sit in a chair or lie on your back to what follows. Rest the side of your foot and ankle on your thigh so the bottom of your foot is accessible for you to grab with your thumbs. 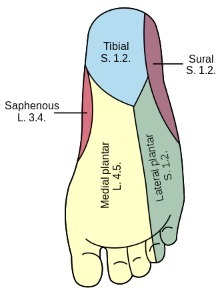 Press your thumbs into the muscle tissue on the bottom of your foot……from the front of your heel bone to the ball of your foot……and notice any spots where the tissue is tender. Remember, tender tissue is inappropriately tight tissue that needs to be released. Now, do the press-pull-release technique on each tender spot. This is described in detail on the the techniques page. Work on each one 30 seconds, then move to another one. Take a break whenever your thumbs get tired. There is not rush, take your time with this. You can also do the press-hold-move technique on this same area while you flex your toes and hold on one spot. Do at least 2 more rounds on the bottom of your foot before moving on to Step 2. Notice how much foot pain relief this specific technique provides for future reference. The nerves that innervate and govern your foot area originate in the sections of your spinal column that make up your lower back and hips. We want to make sure those nerves aren't being yanked on along the way down to your foot, since that alone could cause foot pain. Three simple stretches should do it. *Do not underestimate the power of these stretches. Quite often, they will provide instant foot pain relief for those who do them. This stretch may seem like I'm trying to get you to twist yourself into a pretzel, but once you get the hang of it, it can be one of the best tools in your pain relief toolbox. Watch, pause, replay the video if you need to, and then do this stretch at the level you can. Notice how much foot pain relief this one technique provides for future reference. Once again, you make feel like I'm trying to get you into body positions that are a bit tricky for you to perform. This seated hip stretch along with the reclined hip stretch are two of my "go to" stretches after sitting too long at the computer. Again, the videos are there so you don't have to rush or try and keep up in any way. Go through them at whatever pace allows you to do them properly. You'll be glad you did. First, my Best Hamstring Stretches page is absolutely great if you have any further questions about stretching your hamstrings. If you are good to go, then just remember to flex those quadriceps and keep your legs straight. If you do that, then you'll do great! All the muscles that attach to your foot from above, below, in front and back, and on both sides need to be properly balanced with each other in order for your foot to work properly. The muscles on the very outer edge of your lower leg attach to the bottom of your foot, so they may need to be released as well. So we're going to use the same body position as Step 1 to get the job done. Position the ankle so it hangs out past the leg it is resting on……again just like one would often do in regular life. Now use the hand-on-hand techniqueand press your finger tips from one hand onto the muscle tissue on the very outer edge of your lower leg……from the bottom outer edge of your knee down the side of your all the way down to your ankle. These are your peroneal muscles. Move your ankle from side to side while you press on any tender tissue using the press-hold-move technique. You'll know you're moving your ankle the right way when you can feel the muscle tissue moving under your fingertips as you press. Find as many tender spots as you can and press into them while moving your ankle. You can also use your thumbs on the very lower section of your outer lower leg between your achilles tendon and your lower out leg bone (fibula). Do the press-hold-move technique on any tender tissue as you flex your foot up and down. Take a break. Do at least 2 more sets on these muscles before moving on. How much foot pain relief does this provide? Many of the muscles on the inner side of your lower leg attach to the bottom of your foot, so they may need to be released as well. So we're going to use the same body position as Step 1 to get the job done. Now use both of your thumbs and press them into the tissue of your lower leg……from the bottom inner edge of your knee down to the inner side of your ankle. Move your ankle from side to side, make some circles with your foot, flex your foot up and down, all while you press on any tender tissue using the press-hold-move technique. You'll know you're moving your ankle the right way when you can feel the muscle tissue moving under your thumbs as you press. Stand on the edge of a stair with the weight in the ball of your foot. Slowly , gently let your heel drop below the level of the ball of your foot until you feel a stretch in your calf muscle. Slowly ad more of your bodyweight to the stretch until your heel is as far down as you are comfortable going. Do NOT bounce, go slowly. Now raise your ankle slowly back up to level with the ball of your foot, and then slowly lower it again. Do this and notice how each time your calf lets go a bit more. Important - This is NOT a calf raise, DO NOT raise your heel any higher than the level of the ball of your foot. Repeat this stretch slowly and gently until you notice a substantial improvement in your calf tension. Feel free to do alternate sets with your other calf as it's probably tight as well, and will give your first calf a bit of a break. Is your foot pain completely gone? Partially gone? Which techniques gave you the most foot pain relief? Was there one specific foot pain treatment that instantly relieved your foot pain? Remember what worked best for you, so you can do that at the first sign of foot pain. Are you still experiencing some foot pain? Investigate a bit and you'll eventually find which techniques work best for you to provide the best foot pain relief. Then you'll be able to fix yourself whenever you desire because you'll have your own personalized foot pain treatment……literally at your fingertips! Do the bottoms of your feet feel like they are burning? If yes, visit the Burning Feet Sensation Relief page now.